Did I convince you that tracing is an awesome tool last week? Are you ready to try it? Today I’m going to give you tips for when and how to incorporate it into your art lessons. Next week I’ll focus on the six methods of tracing and have a handy Tracing Quick Reference Sheet, summarizing all three posts about tracing, available for download. You could use tracing in many different art projects with children, but I really love using it as a time saver or skill-gap-filler. So, for example, if I’m trying to condense an art lesson into a 30 minutes time slot, I often use tracing to help the students move along faster. As another example, if my students are likely to be frustrated trying to draw something, I’ll use tracing to give them a quick win. 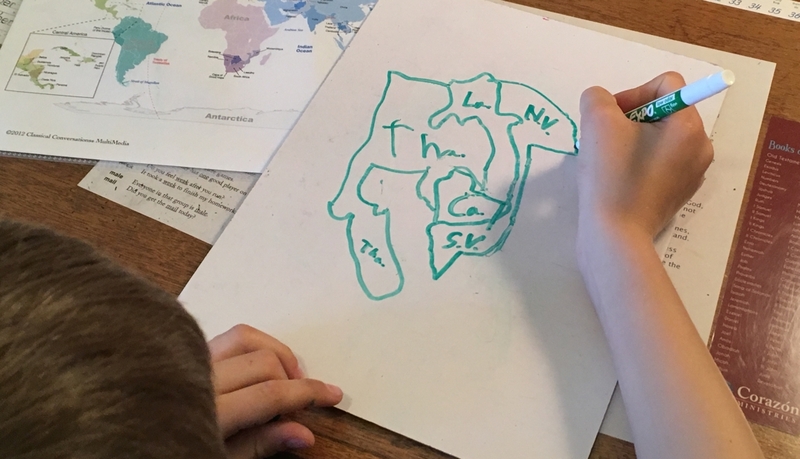 If you have a set of students for an extended period of time like at a summer art camp, try having them trace one thing (maybe their favorite animal) several times. Then have them try drawing it on a blank piece of paper. What did they remember? Have them trace it again and then draw it again. Aren’t you amazed at what they’re now able to draw? Here’s the most important thing: Learn to be mindful while tracing! When you’re having students trace, give them the following tips to help them trace mindfully, not mindlessly. Is this a curved or straight line? Is it moving closer to the line next to it or farther away? At what angle is this line moving? Is it closer to horizontal or closer to vertical? Be open with people about your process. If they ask, tell them you traced the whole thing or that you traced the outline. Encourage your students to do the same. If you’re honest about where you are as an artist, you’ll feel happier with what you’re doing and get to enjoy drawing. You may even encourage others to try improving their own drawing when you talking about tracing! If you’re just drawing for yourself, no worries- do whatever you want. However, if you’d like to sell your traced art, your best bet is to take your own photos, trace them, and be honest about your own process. 3. Don’t assume tracing has the same emotional value as drawing. Many people find that drawing is a relaxing activity while tracing is not. So don’t give up on art if you find tracing to be hard work. Think of it more like a drill. It’s a lot like the basketball player that practices hundreds of free throw shots, or the pianist that plays a few tricky measures over and over again. They do it so that it flows naturally in the game or the performance. I hope tracing becomes a helpful tool for you and all your art students! Next week I’ll focus on the six methods of tracing and have a handy Tracing Quick Reference Sheet, summarizing all three posts about tracing, available for download.